Dairy giant Arla has announced major restructuring in Sweden which could see the loss of between 400 and 500 jobs while investment planned by the company will create just over 100 new jobs. The company says the market for fresh milk is declining, the market for cottage cheese is growing and it is positioning itself to manufacture more milk powder; white gold for dairy exporters. 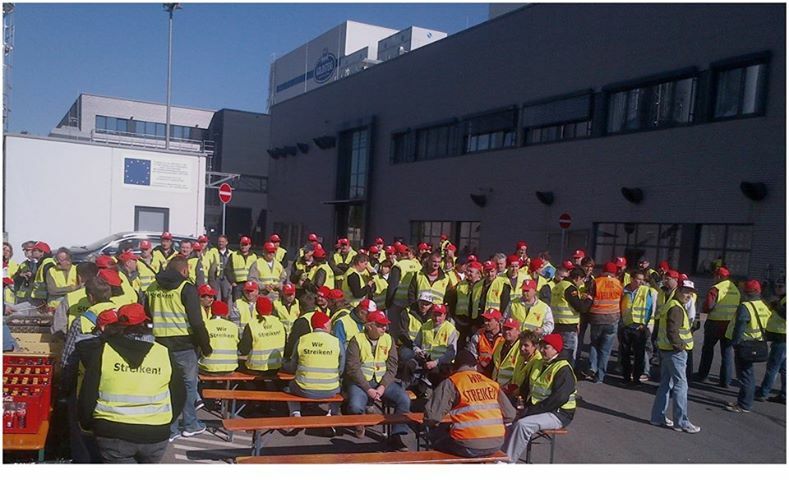 Workers from Germany's Bavarian dairy industry, organized by IUF affiliated NGG are staging warning strikes at many dairy companies against the company`s refusal to offer any wage increase. 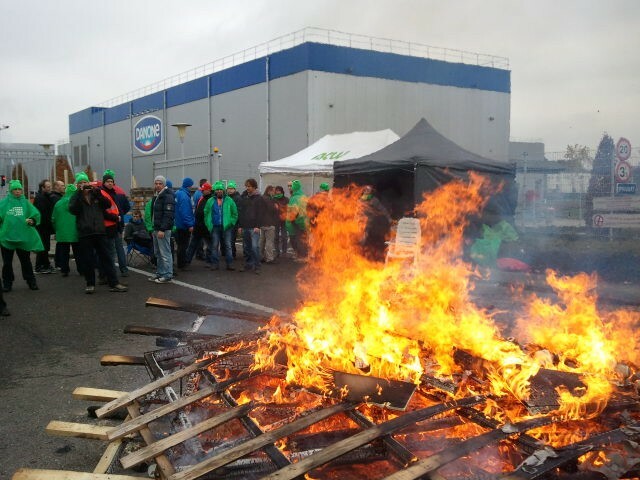 Workers at Goldsteig in Cham walked off the job on October 2. The warning strikes aim to put pressure on dairy companies ahead of the next CBA negotiation round with the union. Dairy companies from Europe, Oceania and Argentina were lifting capacity to supply infant formula to China's growing market. There are 82 million children under the age of 5 in China and only 28% of babies under 6 months are breast fed. Concerns with quality of local milk powder has meant a bonanza for dairy TNCs. Smuggling is a concern and some supermarkets in Europe have placed a limit on purchases as Chinese nationals buy large quantities of formula while visiting. Rabobank has released its list of the top 20 dairy manufacturers based on revenue earned in 2012 and Nestle has extended the lead over its competitors.Nestle's dairy sales revenue was USD30.1bn, an increase of more than $4bn on revenue reported in 2011. Danone, Lactalis, Fonterra, Friesland Campina, Dairy Farmers of America, Arla Foods, Dean Foods, Saputo and Meiji close out the top ten. Starbucks Coffee Company, the world's leading coffee retailer and roaster of specialty coffees, and Danone, the world's leading producer of fresh dairy products announced a strategic agreement to offer a jointly created and developed selection of new, healthy specialty yogurt products in participating Starbucks stores and in grocery channels on July 24,2013. After 62 days of continuous protests the IUF-affiliated Milk Food Factory Workers Union in Punjab, India, won a crucial victory against union-busting and the erosion of working conditions by profit hungry GlaxoSmithKline (GSK) Consumer Healthcare. Please find here the Newsletter of Danone Ecosystem Fund covering topics like sourcing,territory, recycling, distribution and caring services. 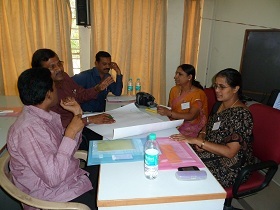 Members of dairy unions affiliated to the Dairy Employees Federation of India (DEFOI) met in Bangalore to plan for the National DEFOI meeting in May. The global organizing initiative "A Fair Deal For Dairy Workers' was endorsed and the workers issues were discussed in the context of the demands of all dairy workers around the world for decent jobs. A union was organized for the first time at the Nutricia baby nutrition plant in Lalru, Punjab, a year after the plant was acquired by Danone through its purchase of Wockhardt Ltd.
On April 9 a mass demonstration by 900 dairy workers and their families against union-busting forced GSK Horlicks Nabha to cut short its annual shareholders' meeting. Faced with questions about excessive royalties, failure to re-invest in the factory and abusive working conditions, management closed the proceedings after just one hour and fled. In a revengeful attack on 1,500 union members fighting for decent jobs for milk collection workers, the GSK Horlicks management slashed the wages of 500 workers by 18% and suspended 16 workers. Another 11 workers face false charges and possible suspension. This comes days after cutting the wages of 248 workers as punishment for joining union protest rallies.